RIP cryptocurrencies? Bitcoin, Ethereum, Ripple bubble bursts, but are cryptos really dead? The performance of crypto market shows that the spectacular run of this particular internet sensation may well come to an end soon. The new Bitcoin? Apple, Tesla, Facebook, Amazon, Netflix, Google in blockchain trade - Is this the next big thing in the crypto world? One investment lesson to remember is that market-related mechanism is always very volatile. The key is patience and learning about trends when it comes to trading in the market. However, one investment tool, namely cryptocurrencies, tend to differ with this theory, because neither can we knowledgeably understand where they are headed nor how to read the truth in their extremely volatile nature. The rise and downfall of cryptocurrencies market is astonishing. It feels like within the blink of an eye, everything that supported the rise of Bitcoin, especially since the end of 2017, has now come to an end at the start of 2018. Now, two-quarters of the calendar year 2018 have passed, and the performance of crypto market shows that the spectacular run of this particular internet sensation may well come to an end soon. A CoinGecko study explains various performance related insights of digital coins that provide a direction when it comes to trading in them. From January 2018 till March 2018 period, there was a dramatic drop in market cap of cryptocurrencies. The market cap which stood near $700 billion went down to between $200 - $300 billion by end of March 2018 of top 30 cryptocurrencies including Bitcoin, Ethereum, Ripple, Bitcoin Cash and Litecoin. 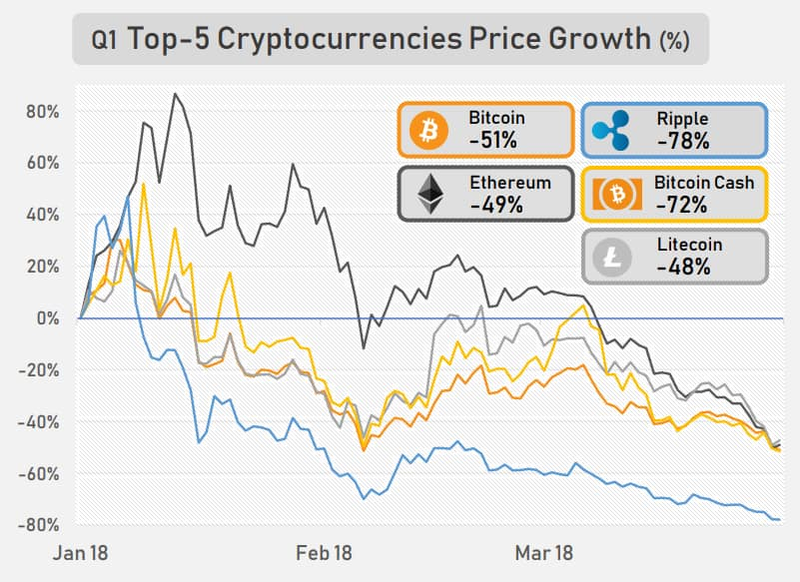 The top 5 digital coins gave away their previous gains between Jan - March period of this year with Bitcoin tumbling by 51%, Ethereum by 49%, Ripple by 78%, Bitcoin Cash by 72% and Litecoin by 48%. Spectacularly, however, on yearly, basis these virtual currencies have recorded gains, with Bitcoin rising by 536%, Ethereum by 684%, Ripple by 2156%, Litecoin by 1571%. However, it was only Bitcoin Cash that saw drop of 9% on yearly basis in top 5 crypto. Since its all-time-high, Bitcoin has seen a price drop of 65%, Ethereum of 73%, Ripple by 85%, Bitcoin Cash by 81% and Litecoin by 67%. These top 5 are not alone, almost entire crypto market has seen a price drop. Average price drop of this market is about 72%. There are two opinions when it comes to trading in Bitcoin and other cryptocurrencies. While there are few who are very confident in trading crypto market. Steven Nerayoff, ETH Co-Creator says, “What you're seeing with Ethereum is exponential increase in the number of projects — there are billions of dollars being poured into the ecosystem right now — maybe 10 times more projects this year than last year, which could easily lead to a doubling, probably a tripling in price by the end of the year." What can you, the common investor, do? According to CoinGecko, Bitcoin remains the largest cryptocurrency by market capitalization, while Ethereum has regained second place. Globally, an unprecedented number of blockchain projects are coming online. Many of these projects are raising funds in the form of ICOs.